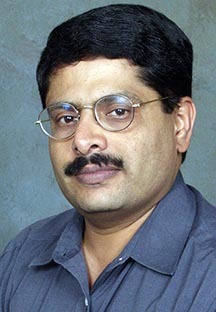 Channapatna Prakash is a professor of plant genetics, biotechnology and genomics at Tuskegee University in Alabama. He’s currently working on the genome of peanuts and important crops in the south and in many developing countries. As a solver with IdeaConnection he’s worked on a crop yield Idea Rally and a Tech Scouting challenge and won awards for both. Here he talks about his scientific research and achievements and what he thinks crowdsourcing can bring to science. We have been working with peanuts for more than fifteen years. I happened to be in Zambia about one and a half years ago and learned about their breeding program and the difficulty of breeding for resistance to two specific diseases. We're trying to find links and molecular markers linked to these diseases so that we can breed better varieties of this crop in Zambia. At the same time we are also training Zambian scientists in genome research. This is one of the important parts of what we do. Not only the research, but also training many young scholars, especially from countries such as Zambia that don't have a genome lab for agriculture. We are not working with genetically modified crops here, but are using the tools of genetic engineering to probe what is really happening in nature, and trying along the way to develop some tools so that peanut breeders over there can develop better varieties of peanuts more rapidly and more precisely. I helped start biotechnology research at Tuskegee University where there was no biotechnology research before and this is a very small university that distinguishes itself because it serves the underserved community in science in the United States, and that is the African Americans. I think I was one of the very first to train a large group of African American students in biotechnology as applied to agriculture. That's probably one thing that I'm very proud of when I look back. Also I helped develop tools to insert genes into sweet potatoes. Secondly, we also started working on peanut and my group was the first to discover genetic variation at the level of DNA in peanut. This helped spawn further research that eventually led to the genetic map of peanut, which is now very useful around the world for peanut breeders. I think the concept of crowdsourcing is really intriguing and the very success rate at IdeaConnection shows how effective it has been. It’s a natural fit for me because of a lot of work I have done over the Internet in trying to bring scientific communities together, and because of my newsletter and a lot discussion groups that I moderate and run over the Internet. Also, the fact that I have traveled to many, many countries and given lectures means that I have a huge network of people that I can draw upon. And so whenever I see something on IdeaConnection it immediately rings a bell, "Oh, yes, this guy in India might have an answer for that or somebody in the Philippines is working on it already." So I am able to connect many of these problems with potential experts. I think that has been a very satisfying thing for me, and I think one of the reasons why in one of those I won, by bringing the most number of people to solve the problem. There is a lot of talent and expertise in many parts of the globe and the technology has helped us to bring them to the table. It also goes beyond the scientific elite and those who are working in very prestigious universities. I think we are going to tap into expertise that is beyond even the universities, even the person on the street for instance. I think IdeaConnection in a parallel way helps to bring a lot of that untapped expertise into play. The technology removes the problem of distance and so someone sitting in Lima Peru maybe is able to collaborate with someone in Manila Philippines on a single problem.